Music? Explosions? Bring 'em on! Note: TechnoFILE's demo units were provided by K&W Audio. If you're looking for home theater speakers that also play music well, you should listen to Definitive Technology's line. Founded in 1990, Definitive Technology has snagged all sorts of awards for its speakers - and they appear to have been deserved. I've been toying with the idea of upgrading my home theater's main speakers for a while now, ever since it became painfully obvious that the surgery I performed on my current speakers' woofers wasn't enough to save the patient. Since I listen to music and watch movies as part of my living, I need speakers that handle a symphony or rock band as well as spaceships and explosions. These would also be used as reference units with which I can compare other speaker systems. It's a tall order but, on the recommendation of a friend, I carted home a pair of Definitive Technology's BP2004TL bipolar towers ($799 each) and, to activate my drool reflex even more, a CLR2500 center speaker ($899). The BP2004TL, second from the bottom of DefTech's bipolar tower series, feature a pair of 1" pure aluminum dome tweeters, another pair of 5 ¼" cast-basket upper bass/midrange drivers and - here's what makes this DefTech line so different - a built in 10" subwoofer powered by its own 250-watt amplifier. 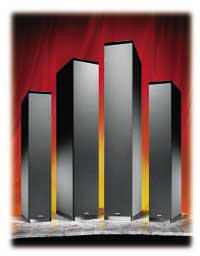 That's right, these towers eliminate the need to have a separate subwoofer, and the extra floor space that entails! Not only that, but by adding the two 10" superbass drivers and their amps together you get excellent bass complete with the stereo imaging that's impossible to create from a separate standalone subwoofer - unless you buy two of them. To facilitate use of the BP2004TL's as home theater subwoofers, DefTech has even included separate "Low Frequency Effects" subwoofer inputs so you can hook them directly into the corresponding output on your preamp or receiver. The downside, if you can call it that, is that you need to have AC power nearby for each of these speakers to power the built in amplifiers. This probably won't be a big deal in most home theaters, however. That takes care of the really thumping bass, an important consideration in a home theater setup that's running 5.1 channel (or more) surround sound. Equally important are the rest of the frequencies, of course, and Definitive has come through here in spades as well. The Bipolar design of the towers means that one of the tweeters and midrange/bass drivers are mounted on the front of the cabinet, with an identical pair mounted on the back (the subwoofer is side-mounted). The rear-mounted drivers fire at the walls, reflecting sounds off them and back into the room. The result is a lovely blend of direct and reflected sound that creates an almost three dimensional soundstage in which the speakers - hell, even your walls! - seem to disappear. Since work forces me to spend more time watching movies than listening to music, I have to favor home theater performance over strictly music reproduction. Fortunately, the 2004TL's performed beautifully in this area; in fact, they were such a step up from my now-moribund reference speakers that it was like day and night. The "DefTechs'" soundstage filled the room spectacularly, while never sounding harsh or shrill - and of course they positively ooze bass when necessary. Not that the speakers' performance when playing music is a slouch! Quite the opposite, in fact. A test CD I use when auditioning speakers includes tracks ranging from unaccompanied vocal to jazz quartet to church pipe organ, and the 2004TL's positively blew me away with their natural and open sound. And loud! A rock 'n' roller at heart, when testing a speaker's mettle I immediately go to the remastered "The Who-Live at Leeds," which is a sure way to see if a speaker will blow up. The 2004TL's, I'm happy to say, exceeded expectations. Not surprisingly, the CLR 2500 center speaker is an excellent match for the towers. It has a built in powered subwoofer as well (better have another electrical outlet! ), and it brings a wonderful clarity to dialogue and music from movie sound tracks. The CLR 2500 is also designed to be installed in threes, for a perfectly matched left, center, and right speaker. I'm sure they'd sound great that way, but I'll take the towers any time, any day. What remarkable musical and movie performance! Manufacturer's info can be found here.